Raider is no longer with us as he passed away . He will live on through his children, and grandchildren. RAIDER WAS TOP IMPORT IN THE UK FOR THE YEAR 2005. 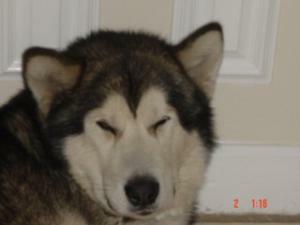 This is Raider showing off his perfect head and soft eye's that is typical of all quality Malamutes. We Imported Raider from Spain on petpassport, he was the 1000th dog to use the passport so Raider was quite a star when he landed in at Gatwick airport., he was one in a million. You couldn't fault him in anyway. It took us a few years to find the boy of our dreams, when we did we was over the moon. We had to wait a year for him to come home. 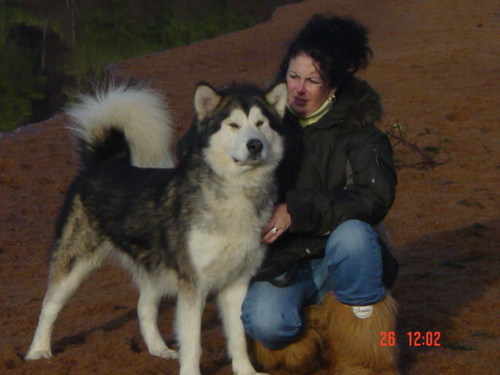 During this time Raider stayed with Anna from Imokam kennels in Spain, where he was treated like one of her own. You can check out Raiders Spanish family by clicking on this site www.imokam.com. 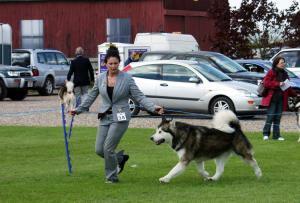 Most Of Raiders offspring have done extremely will in the show ring and on the trails. Our Gucci was sired by the late Raider, I am so pleased we have her, she reminds me of him in many ways. 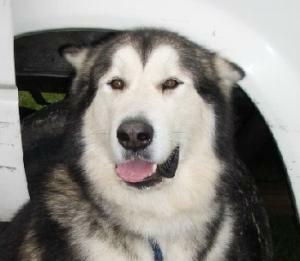 Raider was a very easy dog to show, and it was a pleasure having him in our lives..